It feels like I haven't done a Manicure Monday post in what seems like forever so I'm pretty excited to share this one with you! Over the Christmas break I opted for the usual over the top bling glitter nails and it looks like whilst the festive season is well and truly over my heart can't seem to let go just yet. So this week I popped into the salon for a quick colour change (as much as I am in serious need for infills but that's just going to have to wait) and this is what I'm rocking right now. After having a rummage in my polish collection this colour combo looked like it would work a treat! The majority of my nails are painted with Models Own - Blueberry Muffin. This is such a beautiful pale blue which from a distance resembles white. Perfect colour to add a little brightness when the weather is pretty gloomy. My one accent nail is perfectly blinged out with Ciate - Star Struck . I got this as part of my "All That Glimmers - December Birchbox" last month and thought the shade and the multi-dimensions of the colour would complement the Models Own shade perfectly! So there you have it. 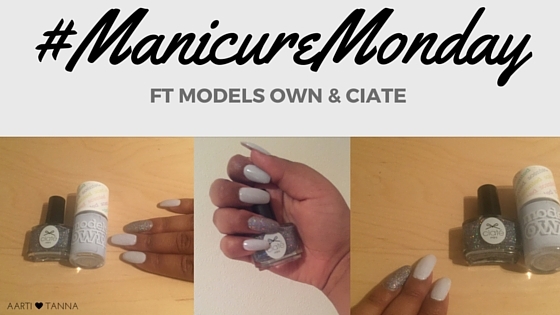 My long overdue #ManicureMonday post featuring Models Own &; Ciate. I think I'm ready to take my nails back to the dark side on my next nail shop visit. What colours are you loving on your nails at the moment? Let me know.